In this group of episodes, Murakami uses his picture-perfect memory to relay the map from the device onto paper. While the group is researching the topography and potential location of the marked place on the map, Kazumi comes over to help. After Murakami tells her it wouldn't be a good idea for her to hack and find out the information, Kazumi strips and attempts to seduce him. 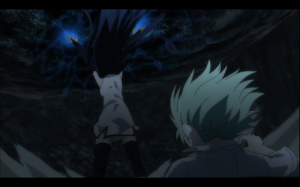 The group also encounters Nanami, a memory-altering witch.